You asked for it, so here we go! For about the last month, there has been a poll up, to determine if you all would like to see longer videos in which I demo cables and lace stitches. I usually choose stitches that aren't too long or complicated in order to keep the videos brief. There are many beautiful lace and cable stitches out there though, and most take longer to do than stitches I have done in the past. The majority of you said you don't mind having to watch a longer video if it means getting to see more cables and lace. I will still do other stitches, but there will now be more complicated/longer stitch patterns as well. 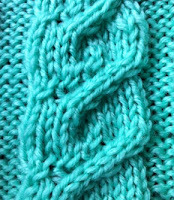 This is the first stitch I chose to do - a beautiful spiral cable. Not complicated, maybe just a little tricky if you are new to cables. Even a beginner can do this, with some practice. If you don't have a cable needle, you can just use a DPN - make sure it is an appropriate size for your yarn. The same size as the needle you are using to knit with is perfect, but you can use a needle one size smaller. Too big and your stitches may get stretched, too small and it will probably slide out of your stitches. 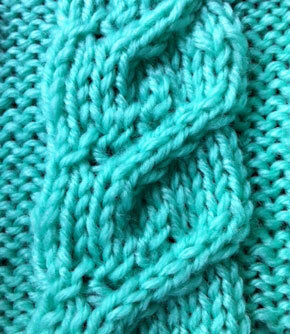 This is a 10 stitch cable worked on a reverse stockinette background, and an 8 row repeat. The pattern below is for the cable only. You will need to add more stitches for the reverse stockinette background. In my sample above, I have six stitches of reverse stockinette on each side of my cable, so I have a total of twenty-two stitches on my needles. You can have more or less stitches separating your cables - whatever looks good to you.